Looking for resources to give you a broad overview of the 1920s? These books will do just that! Please note, however, that this list includes YA books, adult books, and children’s books (marked with an “A,” a “YA,” and a “C” respectively). Why include children’s books, you ask? Well, if you don’t know anything about a subject and need to learn about it in a hurry, children’s books are a wonderful place to start. Most of them provide quick, easy-to-digest summaries of their topic—and the bibliographies in the back aren’t bad, neither ;). In fact, one of my more popular posts would have never happened if I hadn’t found the source I based it on in the back of a children’s book. Prohibition, edited by Dennis Nishi, 2003, History Firsthand series. A collection of primary sources on different topics relating to Prohibition, including “Wet” and “Dry” arguments from key figures on both sides, cops and criminals, the general public’s attitude towards the Volstead, and reactions to Repeal in the early 1930s. Many quotes come from famous figures from the era as well, like Billy Sunday, Carry Nation, H. L. Mecken and Elliott Ness. Every major quotation is put in context by a short informative preface. If you’re looking for a great quote or soundbite, this is a good place to look. 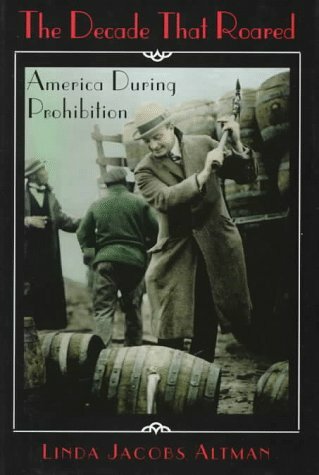 The Decade That Roared: America During Prohibition, by Linda Jacobs Altman, 1997. Unlike the first book, Altman’s book has a stronger emphasis on the cultural upheaval during Prohibition. Topics like the rise of the automobile, the creation of modern-day advertising, and the changing role of women are covered in detail. This book offers a good general overview of the times, with some nice pictures. While this book is meant to be an overview on the whole period of Prohibition, it also offers a large section on Chicago’s underworld and political corruption, especially in the realm of voter fraud. It also offers a lot of great photos you don’t see in other books about this time period, though they’re small compared to the other books on this list. The World History series also has another 1920s book in their series: The Roaring Twenties by David Pietrusza. This book puts an emphasis on the culture clashes of the 1920s, including the rise and fall of the KKK, race relations, small town versus city, and more. Cultural upheaval is a big part of the decade, so it’s nice to see some acknowledgment of it. Looking for more books? Try this post on the best Prohibition Era books for kids and teens. There are books there that adults would find useful as well.